The Rotary Youth Leadership Awards Conference, aka RYLA. This conference will include three days of interactive sessions with High School Sophomores like you! 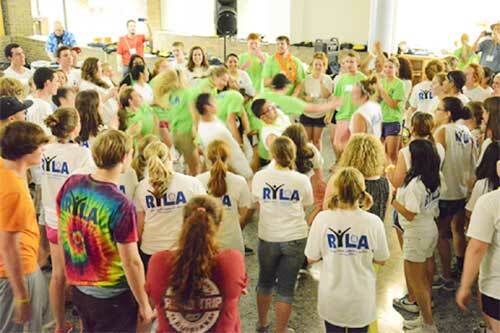 … are all things that previous students have said about RYLA. Activities are designed to help students to stretch and grow. Our full program includes a variety of challenges and enriching sessions which allow them to learn about themselves and others. Students will engage with small and large groups in a program created by student input. The conference is co­ed but the dorms are not. Boys and Girls stay in separate rooms on separate floors. The RYLA 7910 RYLA Conference is presented by Rotary District 7910. This is not a function of Fitchburg State University. Rotary is an international organization of 1.2 million women and men united in service. Most Rotary clubs meet weekly at lunch time. Some meet for breakfast or in the evening. To learn more or to locate your local rotary club go to www.rotary.org and search for your city and state. Do Good. Feel Great. With Rotary! RYLA was the most amazing experience! It taught me to be proud of who I am and helped me figure out what I want to do with my life. There are no limits for me now. RYLA has definitely made me feel more confident now that I’m off to college. I’m not so afraid of the unknown anymore. In order to attend RYLA, students must be “sponsored” by their local Rotary Club. The selection process usually begins with an application, followed by student interviews during February and March. An announcement calling for applicants may be posted in the local newspaper, and/or in local high schools.